Of course the best way to see Australian wildlife is to go on a road trip. But if you would like to see more animals in one day a zoo or a sanctuary are a good alternative. If you get the opportunity to go and watch a world cup game, why not take it? After the summer holidays, school has started again this week. Yesterday Kai came home with eight official looking tickets in his hands for this weekend. I thought it would be for a random game, but it said Davis Cup. Even for a tennis new-bee (that is me) that sounded familiar. If you are at least a little bit interested in tennis (or if you live in Australia and are trying to watch TV on channel 7), you will know that the Australian Open are on at the moment. And since this Grand Slam is happening in our own back yard, we decided that it was definitely worth a visit. Which we did last week Wednesday, during the second round matches. Despite the fact that the media hype only starts with the first round of the men’s and women’s singles tournament on Monday, the grounds are actually home to a qualification tournament to fill the last few spaces in the tournament roster. This happens in the four days leading up to the big event, and is open to the public. Being half Dutch, it goes against the grain to not take advantage of something for free, so Kai and me went there as well. Some of the pictures in this blog reflect that initial visit. After a long, cold and wet winter, spring has arrived! And, contrary to what you normally see in the Netherlands, the weather agrees with the dates on the calendar. – Well, at least if you think of it in terms of the infamous Melbourne Weather, which changes from one minute to the next. Making the most of this change, Willemijn and I decided to make use of the sunshine together, and to go for a walk along the beach in Beaumaris. Hi my name is Luka as you already know. Me and my dad (Oliver) went to the footy. My dad’s friend Pete, and his daughter (my friend) Lucy came too. At the game it was the Saints vs Brisbane lions. At the game, first Brisbane lions where going for the win and then the Saints began to head for the win. Pete brought two packets of chips! One bag of chips was for the adults and one for the kids. Close to the end of the game Lucy and me went outside of the stadium and we did some flips on bars. 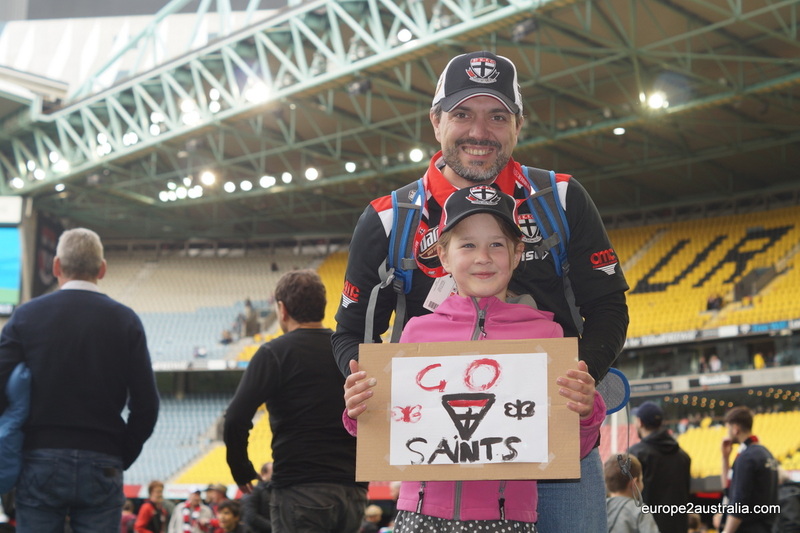 At the end … SAINTS WON! We where so happy! When the game came to a end we got to go on the ACTUAL FIELD!!!!! Melbourne is known for its night-life and festivals. If you look in the right places, there is always something going on and something to be done. The Docklands Winter Festival is one of the highlights for us. Yesterday I got a last-minute call from a colleague of mine, saying that he had two tickets for the St. Kilda – Collingwood game left over and if Kai and myself wanted to come. What a rhetorical question! So we got dressed, had a quick lunch, and off we went. As you do when you have visitors in the city you live in, you do the touristy things that you never get around to doing by yourself. Like visiting the penguins. Or going up the Eureka Tower. Which we did. Penguins. Those cute little birds that can’t fly but can glide under water with almost equal grace. The ones that live in cold places like Antarctica.